Zhenyu Huang (M’01 SM’05 IEEE) received his B. Eng. from Huazhong University of Science and Technology, Wuhan, China, and Ph.D. degree from Tsinghua University, Beijing, China, in 1994 and 1999, respectively. From 1998 to 2002, he conducted research at McGill University (Canada), the University of Alberta (Canada), and the University of Hong Kong. He is currently a senior research engineer with the Energy and Environment Directorate, Pacific Northwest National Laboratory, Richland, Washington, USA. Dr. Huang has over 50 peer-reviewed publications. His research interests include high performance computing, phasor technology, and power system stability and simulation. 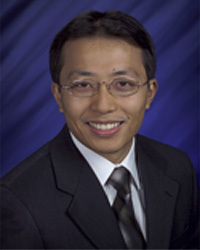 Dr. Huang is active in several IEEE Power and Energy Society technical committees. He led the Richland Chapter to win the 2006 IEEE PES Outstanding Chapter Award.